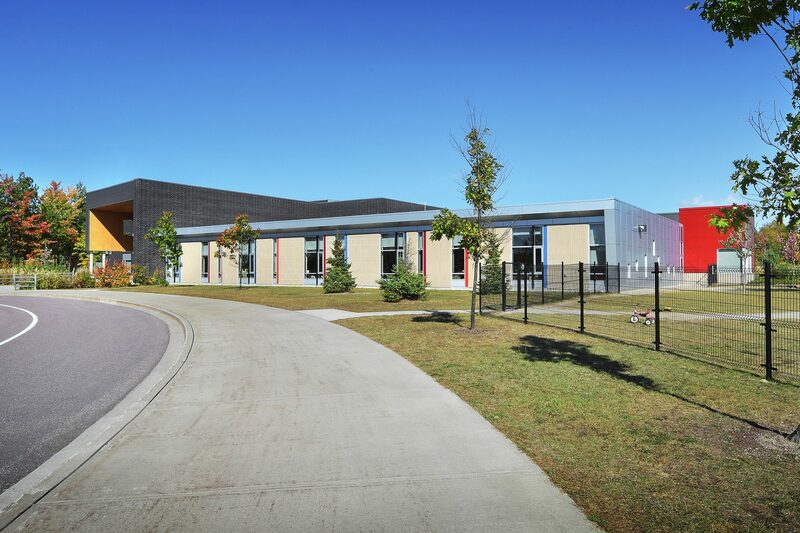 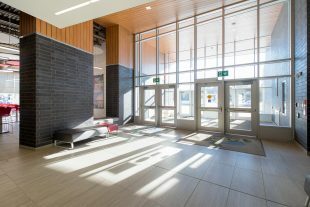 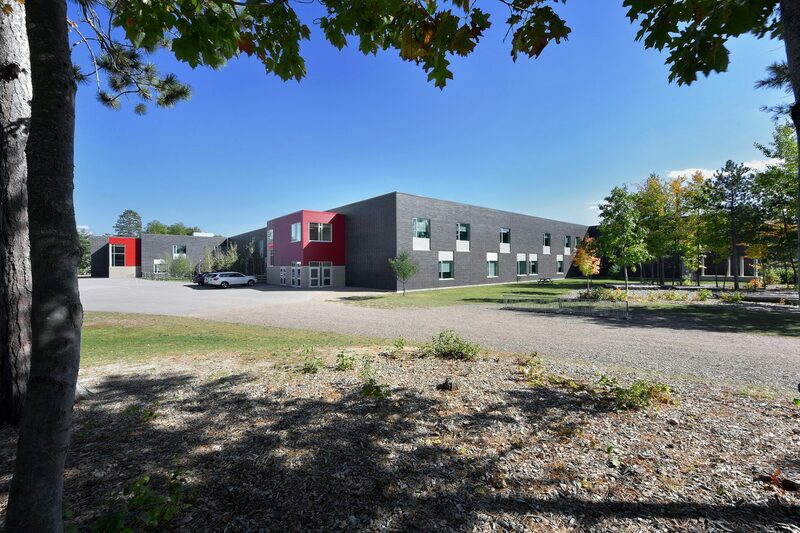 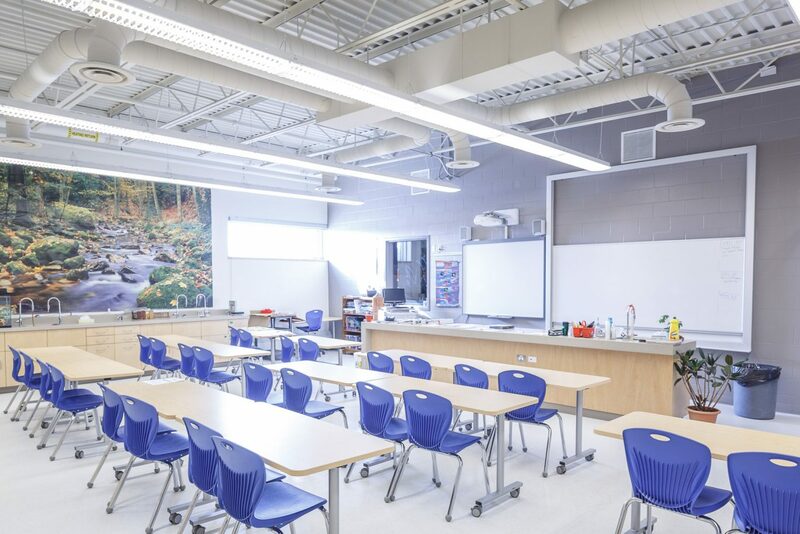 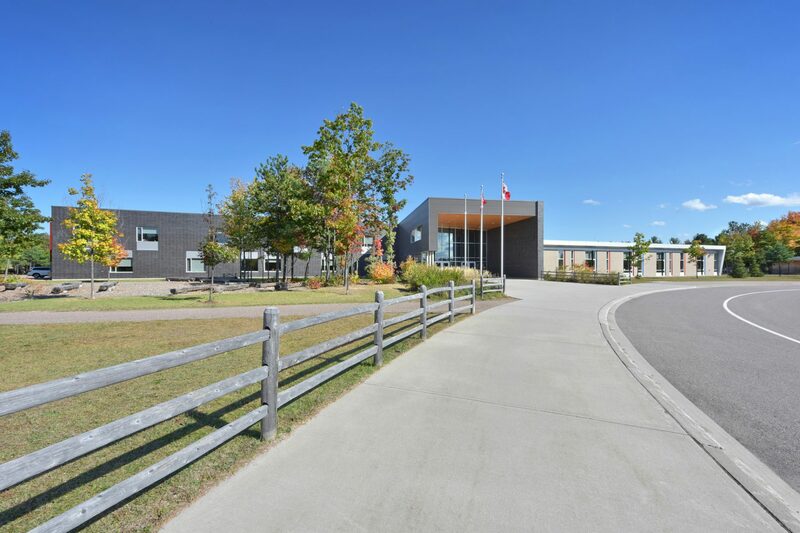 Valour K-12 school combines three schools at CFB Petawawa–General Panet High School, Pinecrest and General Lake Public School–under one roof. 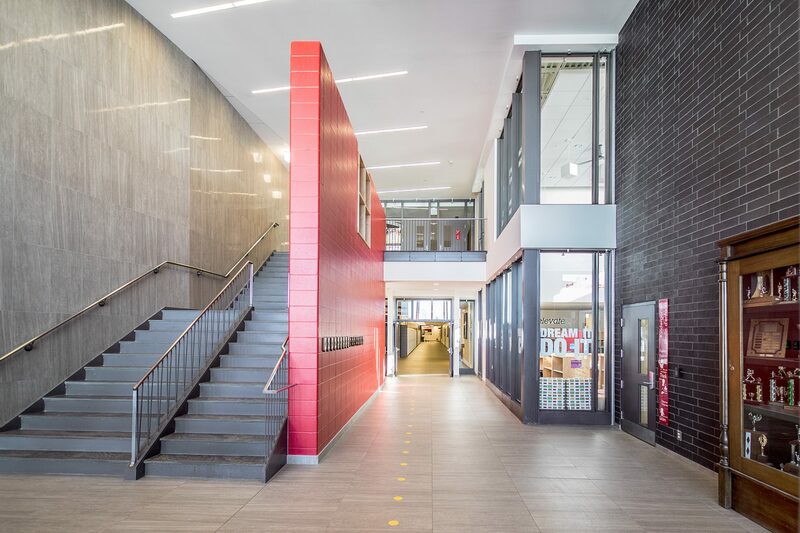 The project started out as a 1,000-student school, but with an announced expansion of the military base came a greater enrollment of students, requiring a complete rethink of the building’s massing, internal configuration and relationship to the site. 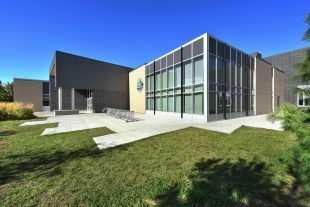 The two-storey, 158,500 sq. ft. steel and masonry building has the capacity for 1,460 students (860 elementary and 600 secondary). The layout of the building is broken down into four pieces. The largest piece is the gym, which can be subdivided into four gyms, and is surrounded on both storeys with a single loaded corridor. 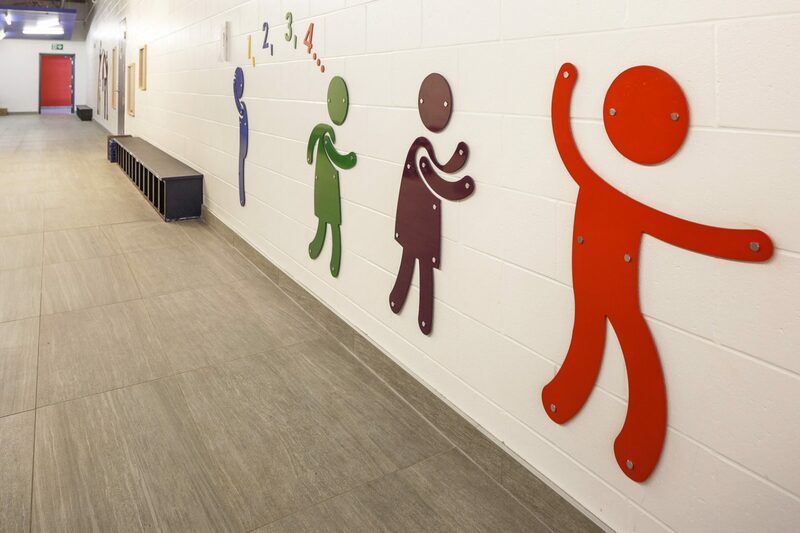 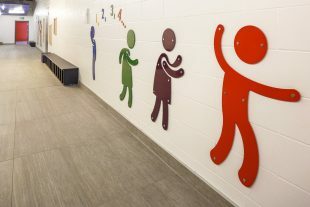 Each corridor has accent colours used on doors and wayfinding to act as queueing for students of all ages. 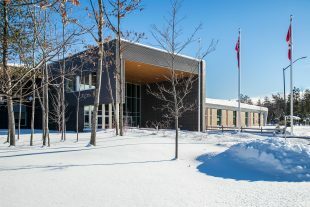 The second piece is the Central Commons which includes Central Administration, Cafeteria and the Media Centre. 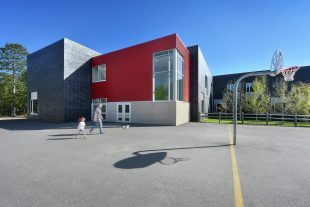 The third piece is the kindergarten zone which has its own corridor that links the bus access to its own secure playground. 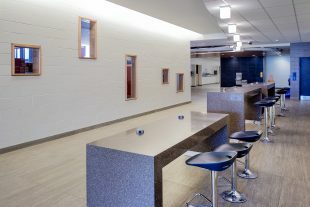 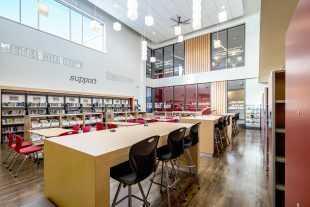 The fourth includes teaching and collaboration spaces. Centralized facilities include a café, gymnasium/exercise room and a media centre/library. 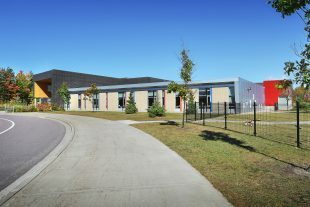 The school offers dual stream English and French Immersion, full wireless connectivity, and capacity for SMARTboards in all of the classrooms. 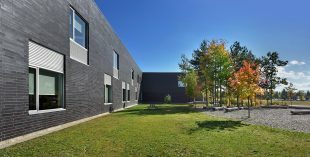 Two outdoor classrooms facilitate a learning experience more engaged with nature, and were constructed with natural materials found on site. 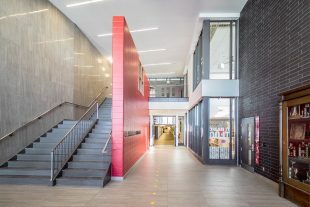 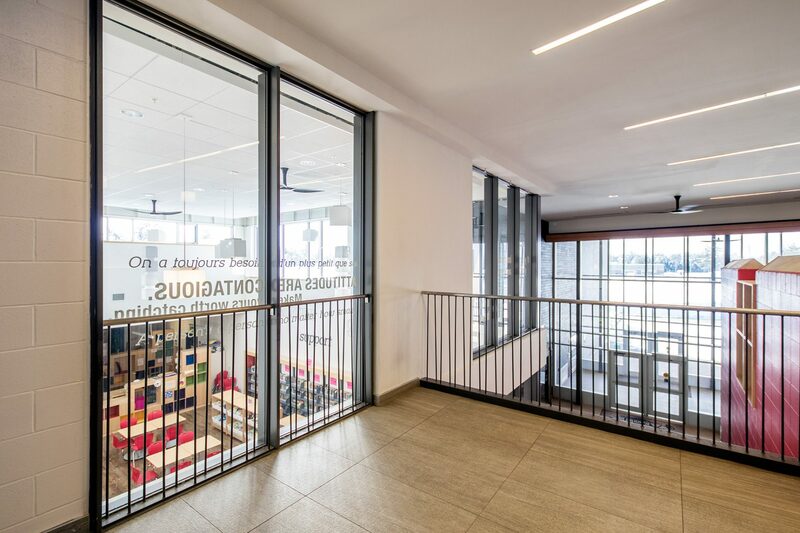 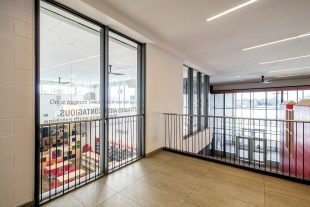 The school’s layout has an embedded strategy that zones spaces by age to ensure that younger students are not intimidated by the scale of the institution. All signage and graphics were prepared by Hobin Architecture and were integrated with the design of the building both inside and out. 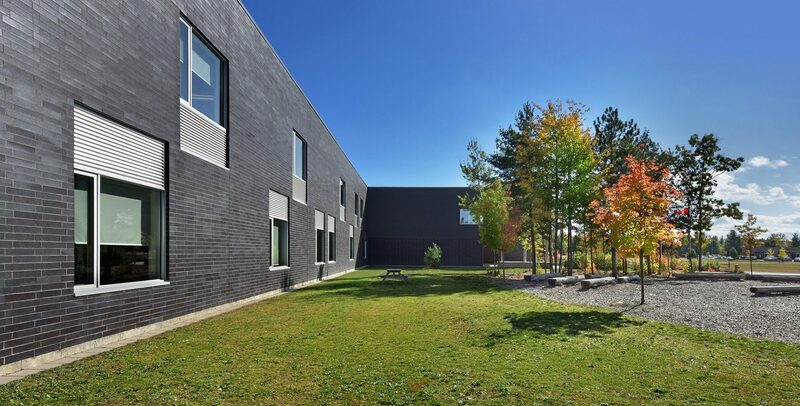 Built around the concept of minimized exterior wall surface, the building is able to optimize heat retention and achieves very low energy consumption for heating and cooling systems. 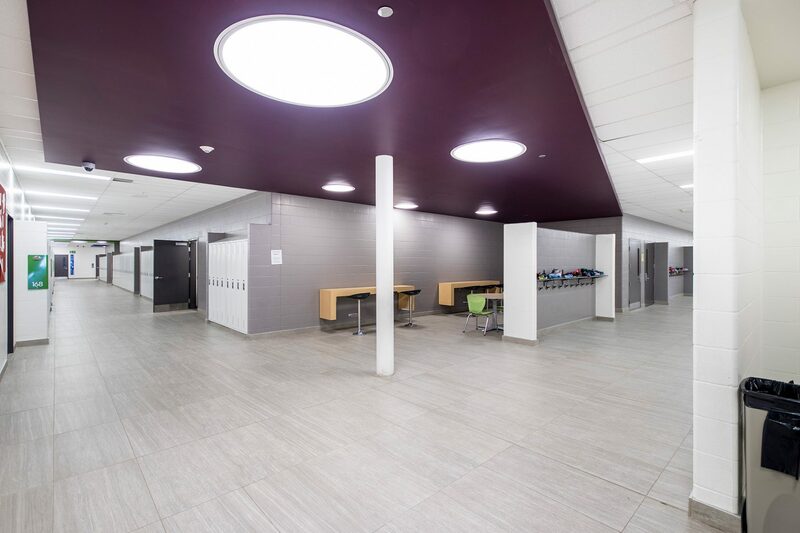 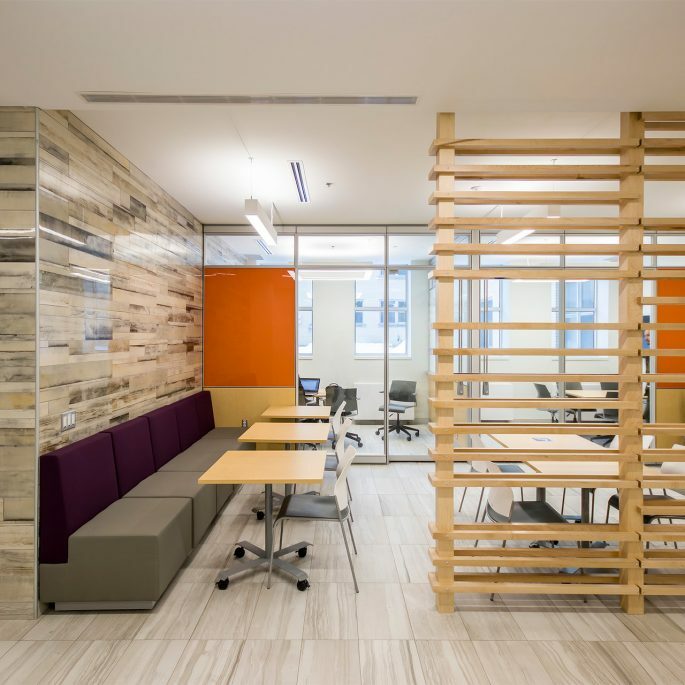 The carbon footprint is further minimized with high efficiency lighting and plumbing fixtures, and a sophisticated Building Automation System (BAS). 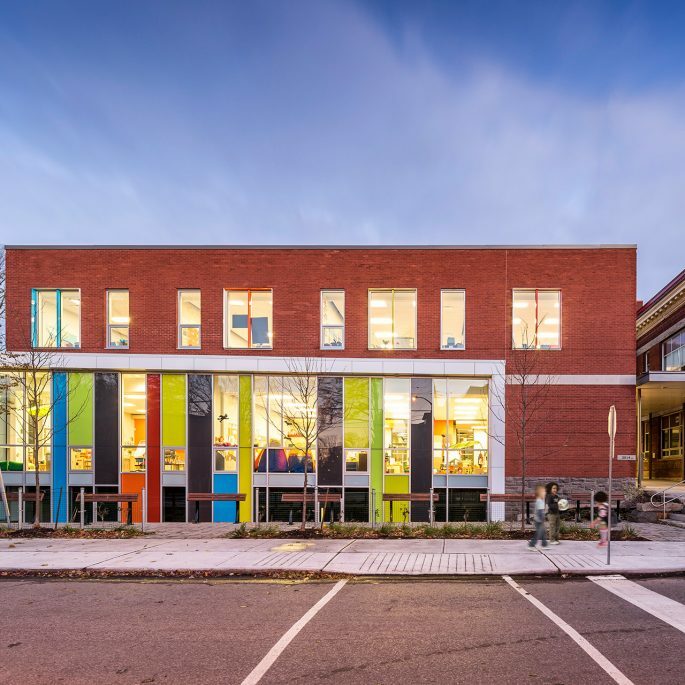 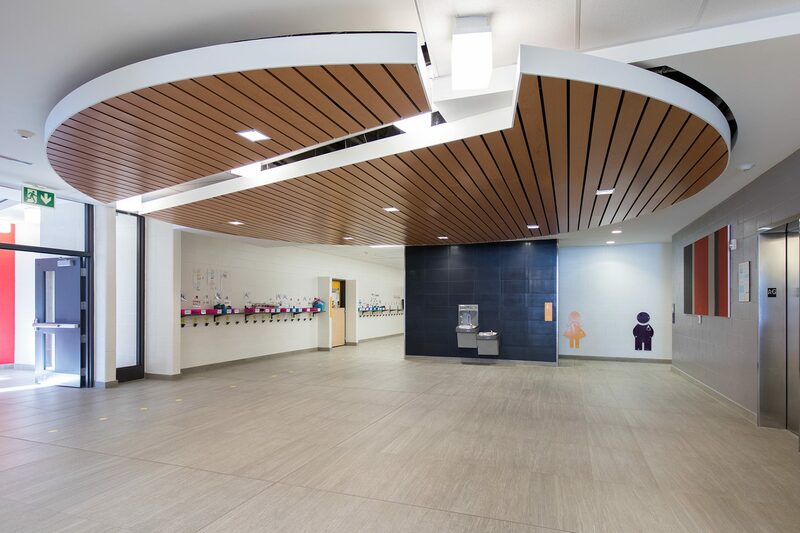 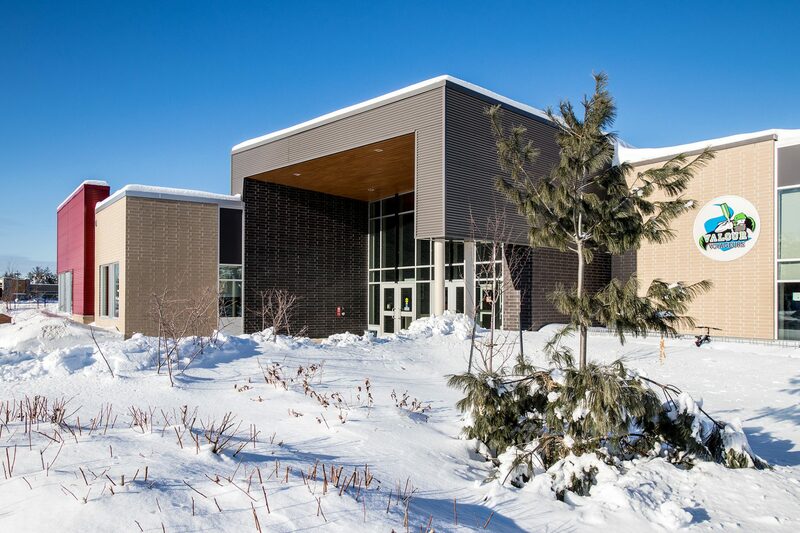 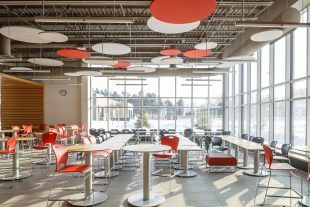 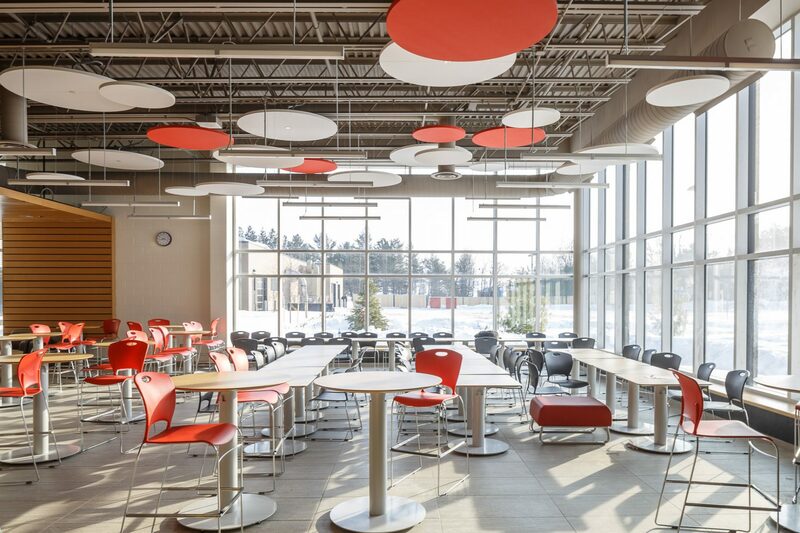 Hobin Architecture were responsible for the master planning of the 21-acre site to serve a 1,400 student K-12 public school, a preschool to grade 8 Catholic school, and a shared football field. 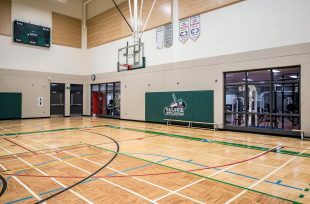 The layout was developed so that each school had easy access to the playing field, and so that canteens and cafeteria access were readily available for soccer and football tournaments.